Instrumental in coordinating Britain’s role regarding Venezuela is the British Minister for the Americas, Alan Duncan, who has spent years working for oil companies. Duncan’s role in enabling the supply of oil to jihadists during the overthrow of Libya’s Muammar Gaddafi in 2011 while UK Minister for Department of International Development, is well-documented. His speech in October left no doubt that he sees his role regarding Venezuela as bringing home the bacon. 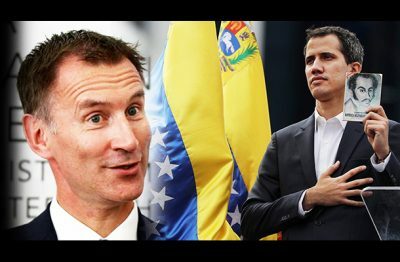 This involves exploiting Venezuela’s resources by throwing them to the free market, but it also fulfils Britain’s role in the shifting of regional power back into the hands of its US ally, and countering the influence of China and Russia who have invested heavily in Venezuela. The motives for the British establishment’s complicity in overthrowing Maduro’s government are numerous. For this reason, it is committed to intervention, and has been for a long time. The Foreign Office, like the EU and the US, has for years invested in Venezuelan civil societies promoting Western neoliberal ideology, and supporting the right-wing opposition in the Venezuelan parliament. This article was originally published on 21st Century Wire.